Take a look at these two Mondaine wall clocks, both modern and timelessly beautiful. Mondaine is the official timekeeper of arguably the most famous of all railways – the Swiss Railroad. You KNOW the Swiss wouldn’t hand out an honor like that to any second-rate clock brand. 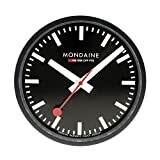 Mondaine is one of the best, and the two must-see Mondaine wall clocks below (both under $200) are all of the highest quality while still being at a decent price! They can give any room a dose of modernism: clean lines, simple shapes, and yet top-notch design through and through. 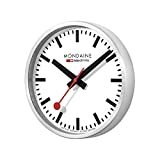 They’ll work perfectly in a den or office, and as a birthday or Christmas gift, these Mondaine wall clocks are a great value for their quality and style. You can bet they’ll be a talking piece for guests and co-workers alike. 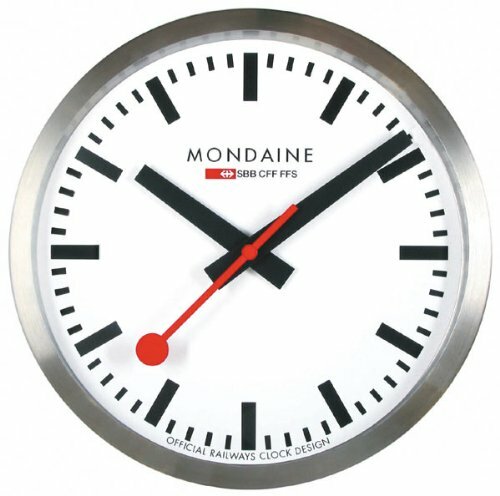 The traditional Mondaine white wall clock in a stainless steel case. This is a great entry wall clock into the Mondaine clock world. Its colors are the traditional ones that you’ll see in train stations all over Switzerland. And with a stainless steel case and Swiss quartz movement of the dial, it’s a quality choice all around! It’s a great birthday or Christmas gift for the railway clock fanatic in your life. Or if you’re trying to give your den or office wall space a little modern touch, this is a Mondaine clock that you can’t go wrong with. How about a little color flip? A stunning Mondaine wall clock with a black dial. 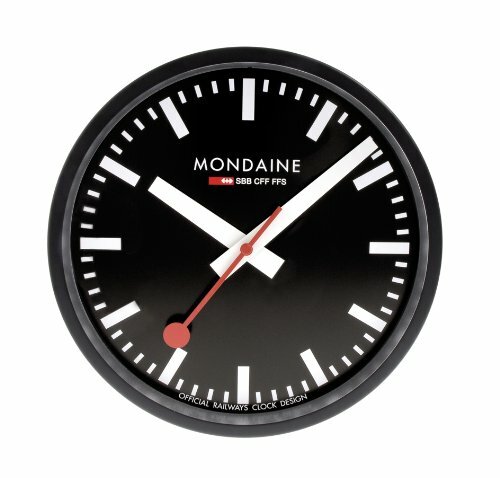 This cool Mondaine clock flips tradition a bit on its head! And the results are definitely cool looking. With the black dial, white markers and hands, and just the tiniest taste of red, you’ve got a clock that can in fact dress up a room. Otherwise, this clock is very similar to the beautiful traditional model above – Swiss quartz movement and a stainless steel case. If your space has a flair for the modern dramatic, and yet you still love simple contemporary lines, this timepiece is the one for you. Mondaine makes a wide selection of time pieces, so if you love the wall clocks, you should check out their amazing selection of watches and desk clocks. All of them have that beautiful modern Swiss design that makes the brand so special. And who wouldn’t love wearing a mini train station clock on their wrist? ‹ Five Cheap Railway Clocks Under $50!